HOW Mine Football Club forward Charles Sibanda is lucky to be alive after he crashed his Toyota Vitz along Mpopoma Drive near the Trek garage on Sunday night. 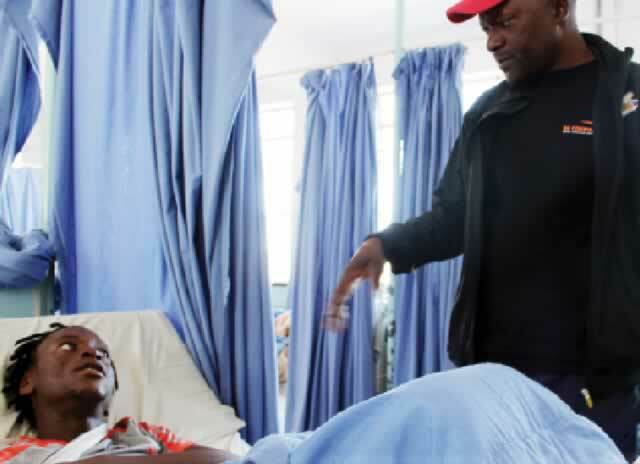 He is still admitted to Mpilo Central Hospital after sustaining injuries to the right shoulder. Alpha Matumbura, How Mine vice-chairman said Sibanda fractured the right collar bone (clavicle) and punctured his lung. “At least he’s fully conscious and no head injury has been noted,” Matumbura said in a brief message to Chronicle Sport. The 2010 footballer of the year was involved in the more serious accident as he was allegedly fleeing the scene of a minor one in which he rammed into a stationary vehicle at the intersection of Mpopoma Drive and Luveve Road. Both cars were driving towards town. Police sources said the player is likely to be charged with failure to stop after an accident. “Sibanda rammed into the car that had stopped at a robot controlled intersection along Luveve Road and upon realising that he had hit another car, he reversed for a few metres, took the right turn into Mpopoma Drive and sped off,” said the police. Unbeknown to Sibanda, another motorist had witnessed the accident and gave chase before taking down the registration number of the striker’s vehicle and giving it to the victim. Checks revealed that the car was registered in someone else’s name and the former owner indicated that he had sold the car to Sibanda. “While the car that gave chase had long turned back, Sibanda kept on driving until he lost control of the vehicle,” said the police. Yesterday, How Mine coach Luke Masomere visited the player in hospital and expressed sadness at the unfortunate incident. “It’s not a bad injury although he is clearly in pain. The mishap comes at a time when his form had just picked up and we were looking forward to his industry on the field as we resume our league matches this weekend,” said Masomere. How Mine take on Hwange at Luveve Stadium on Sunday. Sibanda becomes the second Premiership player to be involved in a car crash this month after Highlanders’ Mthulisi Maphosa escaped death by a whisker when his car overturned at a sharp curve in Cowdray Park a few days ago.